Both Liverpool and Chelsea switch their focus back to the Premier League with hosts hoping to record an important win in their title pursuit. The Reds are coming off from a morale-boosting Champions League win over Porto and will have to be on top of their game in one of the biggest test of their Premier League title race to date. Chelsea may well be without chances of launching the title challenge but the Blues will be inspired to give everything they’ve got. Eden Hazard has been enjoying a sensational form of late despite his team playing pretty patchy and Jurgen Klopp’s charges will have to be wary of the threat arriving to Anfield on Sunday. 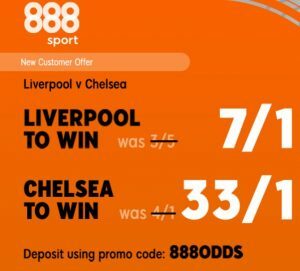 Games between England’s top sides are always hard to call but 888sport firmly believes Liverpool are well positioned to win and are offering an enhanced odds new customer special with 7/1 betting odds offered on Reds instead of standard 3/5. Chelsea are also available at an enhanced price with 4/1 being boosted to whopping 33/1. The offer is available to players who register an account through this link and make a minimum £10 deposit using promo code 888ODDS. Qualifying bets must be placed at the normal odds while the extra winnings are paid in free bets. Terms and conditions apply. 18+ only. Please gamble responsibly.